Full disclosure: I'm listing this car for my sister. She wants to sell it because her commute distance is about to increase dramatically, and she needs something that gets better fuel economy and takes regular gas. 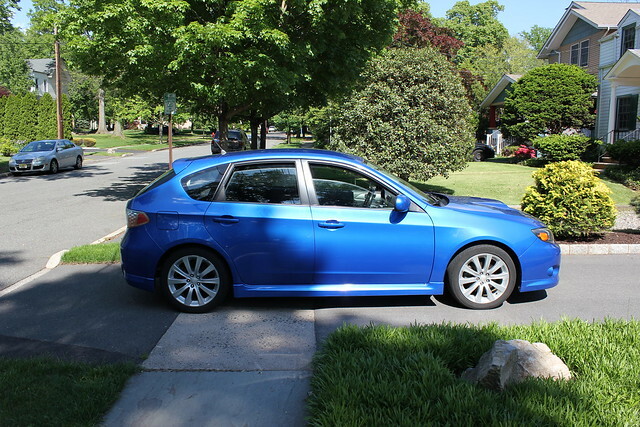 I've owned a couple of performance-oriented Subarus in my day, and I've lurked on NASIOC for years, and in my nonprofessional but very enthusiastic opinion, I think her car is very clean. Now that you know the exciting backstory, read on for details! Paint and body are in great shape — her car is always parked in private lots and rarely on the street. As someone who lives in NYC, I envy her bumpers. I think the car has some kind of aftermarket exhaust / downpipe, also done by the previous owner — I haven't investigated fully, but the car sounds quite nice without being loud. The car pulls hard and drives well. Let me know if you have questions and I'll do my best to answer them. The best way to contact me is via email - chrisdiken [at] gmail [dot] com. I'll get back to you ASAP!